Speaking about the history of baccarat game, we should not forget about its trip to England in the 19th century when the Queen of this country was Queen Victoria (1837-1901); actually, baccarat became popular in England thanks to Queen's son whose troubles brought the game to people. The known fact is that the most popularity baccarat has gained in France after Charles VIII had brought it from Italy in the 15th century. France has given a birth to such baccarat variations as Chemin de Fer, which is believed to be the main baccarat game of Europe today, and Baccarat en Banque (which is also known as European Baccarat today and which was developed in England afterwards). In spite of its incredible popularity (many French aristocrats were passionate baccarat players, including Napoleon and King Louis-Philippe), it was a period when baccarat was prohibited in France. What could it do? The right answer is: to find a new place to continue its developing! Englishmen discovered baccarat card game thanks to the son of Queen Victoria: he liked to gamble and had some troubles with this hobby. Once, when he had some money troubles with casinos because of baccarat game, everyone found out about this fact; thus, people became curious about the card game which was able to cause so much noise around the royal family. 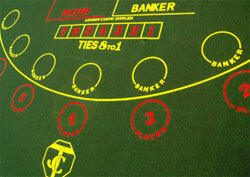 So, Englishmen began to play baccarat mostly for fun; but certainly some people chose to play this game for big money. English gamblers were the ones who developed Baccarat en Banque which was considered to be the fully English variation of baccarat. Well, thanks to their not very serious prince, Englishmen became the admirers of one more casino game which is played all over the world now. We are sure that they did not forget to thank him! It should be added here that thanks to Englishmen baccarat had moved to the USA: English colonists brought it to America together with French immigrants in the very beginning to the 20th century; so, the role of England in baccarat history is very important indeed!